Bilberry Fruit comes from the Bilberry Tree, Vaccinium myrtillus. Bilberry Fruit looks very similar to a blueberry, and is actually one of its close relatives. Bilberry has also been called Dwarf Bilberry, Bog Bilberry, European Blueberry, Huckleberry, and Whortleberry (Sloan-Kettering). Bilberry Fruit is available as fresh and dried fruit, tea, and as an extract (UMMC). Bilberry Leaves have applications in the management of Diabetes. Before Insulin, Bilberry was used effectively as Diabetes treatment. When Insulin became available, Bilberry was used to improve it efficacy, and in some cases reduced the amount of Insulin necessary to achieve appropriate Blood Sugar Levels (Bailey, and Day 553-564). Bilberry Fruit is rich in Anthocyanosides. Anthocyanosides have antioxidant activity, and can improve circulation and help prevent blood clots. Billbery also contains Tannins, which are thought to decrease inflammation. Bilberry has been used in Europe to successfully treat diarrhea for a very long time. There has not been research on Bilberry related to diarrhea, however, it is believed that it is the Tannins in Bilberry which reduce gastrointestinal tract inflammation and alleviate diarrhea (UMMC). Bilberry might also be useful in improving vision. Anthocyanidins in Bilberry increase the production of Rhodopsin, a pigment in the eye which helps the eye adjust to changes in light. Pilots during WWII claim their night vision improved after eating Bilberries (UMMC). However, studies have shown that Bilberry Fruit does not significantly enhance night vision (Levy, and Glovinsky 967-969). 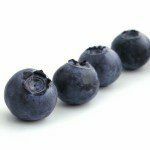 Although more research needs to be done, Anthocyanosides in Bilberry may also help individuals with Cataracts and Macular Degeneration (Sloan-Kettering). Therapeutic amount of Bilberry Fruit are not associated with any serious adverse reactions. Individuals on anticoagulants should not use Bilberry Fruit as it may increase their risk of bleeding. Also, Bilberry lowers blood sugar, so it should not be used with other diabetes medications, as it can cause blood sugar levels to drop lower than normal. Bailey, Clifford, PhD, and Caroline, PhD Day. “Traditional Plant Medicines as.” Diabetes Care. 12.8 (1989): 553-564. Web. 5 Jul. 2012. “Bilberry.” WebMD. N.p., n.d. Web. 5 Jul 2012. “Bilberry Fruit.” Memorial Sloan-Kettering Cancer Center . N.p., 9 Mar 2012. Web. 5 Jul 2012. Ehrlich, Steven, NMD. “Bilberry.” University of Maryland Medical Center. 31 Dec 2010, n.d. Web. 5 Jul 2012. Levy, Y, and Y Glovinsky. “The effect of anthocyanosides on night vision.” Eye. 12.6 (1998): 967-969. Web. 5 Jul. 2012.